Popsicle sticks. Such a simple little item, yet one that can perform miracles in the classroom. Ok, they won't perform miracles, put they will help you in your quest to have a classroom of engaged learners, and that's kind of a miracle, right? When I was sitting in a workshop several years ago, the presenter was talking about the "raise your hand" method of engagement and asked how many of us used it. Naturally, I raised my hand! She then asked us to ask ourselves, "If I had a checklist out for each student that I called on, would I have called on every student in the class the same amount of times in one day?" The answer was so obvious that it caught me a little off guard. Of course, I was mostly calling on the students who were raising their hands. I was certainly calling on other students, but not as consistently, and as a result, some students were definitely getting missed. I vowed to change that up right away. The next day, I went to Michael's, bought a huge box of craft sticks, and began my new mission of popsicle stick engagement. As you can see in my picture above, I use the big popsicle sticks in my classroom. I also take masking tape (of the cute color variety) and wrap a different color around each end. Then, when I get my class list in the fall, I write each student's name on both sides in the middle. You're probably wondering why my picture has two sets. That's because I teach two sessions of science (my homeroom and my teammate's), so I have a set for my second science class as well. So how do I use them? I stick each set in a cup, like one of those cute cups from Target's Dollar Spot (because who can resist that section), and keep it on my desk. I pull a stick any time that we are going over homework, reviewing for a test, practicing a newly learned skill or strategy, or I need a student to help me model a concept. I basically reach for a stick at the exact moment when I used to say, "Please raise your hand…"
Now, you may be wondering what I do with the stick after I have called on a student. This is why I have two colors on the sticks. Once I have pulled a stick and a student has shared to my satisfaction, I flip the stick to the opposite color. Then I know not to pull that stick again until all of the others have been flipped as well. This eliminates the need for an additional cup for your "used" sticks. Notice that I said that their answers had to be to my satisfaction. If I pull a stick and a student isn't ready, their stick goes back in without being flipped. That's only if they aren't ready and aren't trying, though. I do not punish them if they give their best effort and get it wrong, I simply flip it and ask them to call on a helper (and hands can be raised for this, though it does not get the helper's stick flipped). Once all students have been flipped, I start the process again. 1. Students are far more apt to be listening when they know that they are going to be called on. They will be engaged because they know that you are holding EVERYONE responsible. 2. You are guaranteed 100% participation. 3. You will be distributing your selections evenly. Additionally, these sticks are AWESOME when it comes time for groupings. Simply decide how many students in each group and pull that many at a time. Three in a group? Pull sticks and announce names as you pull them. "Stacy, Steve, and Max, you are in group #1," and so on. 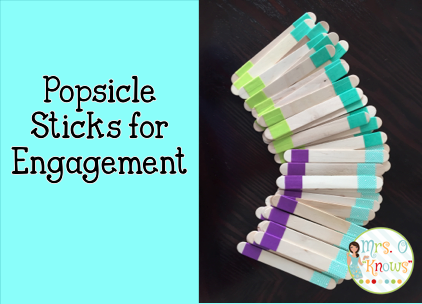 Popsicle sticks make life just a little bit easier in the classroom and we could all use some of that! I use this method too! But I love the idea of using masking tape on each end instead of trying to paint them!